Could she ever been queen? 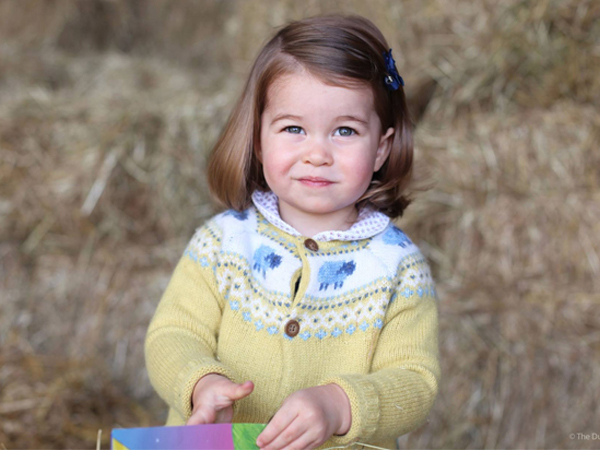 Give a hip-hip-hurray for little Princess Charlotte, who celebrates her second birthday today, 2 May! To mark the special occasion her parents, the Duke and Duchess of Cambridge, released a delightful snapshot of the youngster. Taken at their home, Amner Hall, by Kate, it shows the youngster looking as cute-as-a-button, in a yellow patterned cardigan and her hair neatly pinned back. So with two years behind her now, here are 5 things to know about the birthday girl. Apart from the odd official photo, we haven't seen much of Charlotte. That's because her parents have tried to keep her mostly out of the limelight and away from the paparazzi. However, she will make a star appearance as bridesmaid for her aunt Pippa's wedding in a few weeks time. 2. Who in the family does she resemble the most? Many have said the youngster closely resembles her great-grandmother, Queen Elizabeth 2, as a child. Although she does share her mother's lustrous brown locks and grey eyes. 3. What awaits this year? The family is expected to spend more time in London this year at their official residence, Kensington Palace, as William leaves his air ambulance helicopter pilot job to take up more official duties. It's believed Charlotte will start nursery school later in the year when George (3) starts school in September. 4 Does she see her 'other' grandparents? It's well known Kate's parents, especially her mother, Carole Middleton, are very involved in Charlotte and George's lives, less so for William's father, Prince Charles. Charlotte and George rarely see Charles due to his many royal duties, up to 600 public engagements a year! Despite this he is very fond of them, and has said, "They'll look after me when I'm tottering about." 5 Can she ever be queen? Charlotte -- whose full name is Charlotte Elizabeth Diana -- is fourth in line to the throne, behind Prince Charles (her grandfather), her dad, Prince William, and her brother, Prince George. While it's fairly unlikely that the tot will ever rule the kingdom, she has a stronger claim to the crown than her uncle Prince Harry.